Production for “Hemispheres” wasn’t easy, and I think the band reached their breaking point with sidelong tracks. The production of their first instrumental, “La Villa Strangiato: An Exercise In Self-Indulgence” lasted as long as the entire production of the entire “Fly By Night” album, with the band finding themselves unable to play the song in its entirety for recording (at least to their satisfaction), and being forced to play it in “sections” and then edit them together to get the sound quality they were looking for. It should say a lot that while the album has the fewest tracks of any Rush album (a scant four), it’s far from their shortest, using all 42 minutes that a vinyl LP of the day would allow. It’s telling that the band would never write another 20 minute, sidelong multi-part epic again after this, and only two more songs by them (“Natural Science” and “The Camera Eye”, respectively) would even approach the ten minute mark. It’s perhaps also telling that Geddy would sing in a much lower register after this album, giving up his early day “wail” for good when the band tried to record vocals for the album and discovered it was a semitone too high even for him. Perhaps this was for the best though, because I personally feel the “Cygnus X-1” duology was as far as they could have taken it, and it was a great note to end the sidelong tracks on. While “2112” is more iconic, I always felt both parts of “Cygnus X-1” were more dynamic and consistent musically, coming back to certain parts in a meaningful way instead of aimlessly meandering like they would on “Fountain of Lamneth”. The story this time around is that there is a war amongst the Gods on Mount Olympus. Apollo is encouraging strength of the mind, while Dionysus is encouraging strength of the heart, and a war is waging because of this. So who should show up but the captain of the ship who went through the blackhole in the first song? His “silent scream inside” immediately causes the fighting to end, and for people to see that “a balance” between the heart and the mind (the two hemispheres of the brain) is what it takes, so the Olympians make the spaceship captain into Cygnus, the God of Balance. 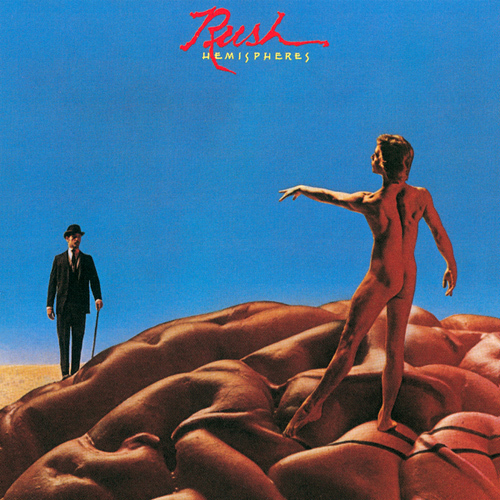 There’s a joke surely about Rush writing a song so long that it extends across two albums, but “Cygnus X-1 Book II: Hemispheres” manages to build upon the melodies in “Book I” while still going off in its own direction. I won’t lie; out of all the sidelong tracks I’ve listened to so far writing these reviews, “Cygnus X-1 Book II” is the one I listened to the most. It’s so dense yet dynamic, there’s always something new to find. It has everything a Rush fan would want: good riffs, a good story, wild guitar solos from Alex, great synth solos from Geddy (the ambient part when the protagonist enters Olympus being my favorite), and great lyrics from Neil. I can’t tell you how many times I love to scream “They knew love could not be wrong!” or “Dionysus thought me mad!”. It even ends with a tender folk section about how “we can walk our road together if our goals are all the same”. In short, a great, epic song. The following track, “Circumstances”, is a bit heavier and darker, chronologing Neil’s demoralizing time in England trying to make it as a professional musician. The heavy riffs give way to another gentle synth solo by Geddy in the middle, with Neil’s bells and chimes adding a nice garnish. It’s a good song, but of the four on “Hemispheres” it’s easily the weakest and would slowly be phased out of the setlist by the end of the subsequent tour. Still, it was revived on the recent “Snakes & Arrows Tour”, to fans’ surprise and delight. The next song, “The Trees”, was inspired by a comic strip Neil saw of trees arguing like people, and later he said he would find the lyrics he wrote to be “trite”. The basic premise is some maple trees wanting more sunlight, declaring the taller oaks to be greedy despite their pleas to the contrary. In the end though, all the trees are felled by human axes for the logging industry. It’s definitely silly, but I embrace it because not only does it show Rush not taking itself too seriously again, but it still works as an effective parable about how in-fighting within a certain group can lead to mass exploitation from outside forces. Despite Neil’s misgivings, “The Trees” has been a concert staple and a fan favorite for years, and it’s one of my personal favorite Rush songs. Musically, it’s up there with “Closer to the Heart” in being one of Rush’s most ambitious compositions in a scant five minute time frame. It starts with Alex’s nylon string guitar, goes into the rock section, then an extended flute-emulating synth solo from Geddy which builds up the excitement leading to Alex’s solo and the declaration of the trees all being kept equal “by hatchet, axe, and saw”. The album closes with the aforementioned “La Villa Strangiato: An Exercise In Self-Indulgence”, Rush’s first instrumental and perhaps their most ambitious. The song was inspired by a dream Alex Lifeson had, and the various sections correspond to the different parts of that dream. This song became another concert favorite that’s still played by the band as recent as their last tour, and it’s not hard to see why, with it’s boundless energy and twisting turns. Live performances would also add a slightly extended section before the reprise where Alex would engage in stream of consciousness rants, which would vary from night to night. Of the shows I’ve seen, I’ve seen Alex rant about Paris Hilton, a dream about a goat driving a bus (which is weird because the sheep was supposed to be driving the bus), and how the movie “Titanic” would be vastly improved by adding ninjas. WEAKEST LYRIC: None this time.